Manchester International School’s commitment towards diversity and inclusivity is grounded in the School's mission and core values. We're a community where those who live, study, and work see difference as an opportunity to learn about ourselves, each other, and the larger world. We put these values into practice by welcoming students from different cultures, heritages, identities, and perspectives. We are intentional about promoting an inclusive, student centered environment by providing programs and other opportunities to extend an understanding of others, form respectful and civil relationships, and develop skills in interacting efficiently across differences. 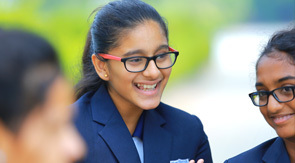 Manchester International School has so many things to offer: excellent academics (CBSE, IGCSE, AS & A Levels, IB PYP & DP,) beautiful campus, university counseling, extra-curricular activities and so on. However, one of the biggest highlights is the multicultural environment. Your fellow students are not the only ones at an international school that provide multicultural opportunities. The staff at school comes from diverse backgrounds as well. They provide mentorship and guidance with cultural sensitivity and knowledge. Assemblies of multicultural celebration and sharing are often organized and encouraged by the staff to help maintain a welcoming family atmosphere within the diverse population of the school. Recognizing that there is an assortment of lifestyles, beliefs, as well as commitments, students obtain the top hand making independent options about their course. Pupils learn a variety of various societies, music, foods, and methods that have developed with. Research study environments that have a varied blend of cultures decrease the menace of minority group favoritism. Students finding out as well as growing in multicultural surroundings come to be adaptable as well as certified to transform. Schooling environments with various religious beliefs, races, and also social backgrounds proffer learners the possibility to grow a greater perceptive of diverse cultures living in the world. Youths understand new ideas, perceptions, and values very quick, and consequently could examine to prize and understand other individuals options as well as lifestyles. Cultural differences could craft substantial barriers to efficient participation. Understanding in an International Company school setting help students recognize the regimens of some professionals from different nations as well as for this reason you could be able to do organisation internationally without misconceptions that may arise while working with somebody from a different nation. Individuals that speak several languages have a greater probability of doing well in commerce. In an ever a lot more globalized economy, researching languages is absolutely valuable for corporate success. The international service neighborhood has actually long acknowledged the benefits of efficient communication throughout lots of languages as an important tool for connection creation and financial success. Expanding and finding out in a modern atmosphere offers kids a higher understanding of others beliefs, mindsets, as well as behaviors. With this understanding of others, kids will certainly have a higher level of interpersonal as well as social abilities. This is significantly helpful for kids leaving institution, and going into higher education and the office. With the abundant variety of way of lives and ideas participated in the working globe, future generations come to be more liberal in their approach to life, while ending up being a lot more united in their culture.